A guide to the identification of neuromusculoskeletal pathology and other conditions that present as musculoskeletal problems, aimed at physical therapists. The text outlines a step-by-step patient evaluation approach that follows competency standards established by the APTA. This updated edition provides physical therapists with the information they need to readily identify neuromusculoskeletal pathology and other conditions that present as musculoskeletal problems, and distinguishes conditions that may require further medical care. It outlines a step-by-step approach to patient evaluation that follows the standards of competency as established by the APTA for screening examinations. 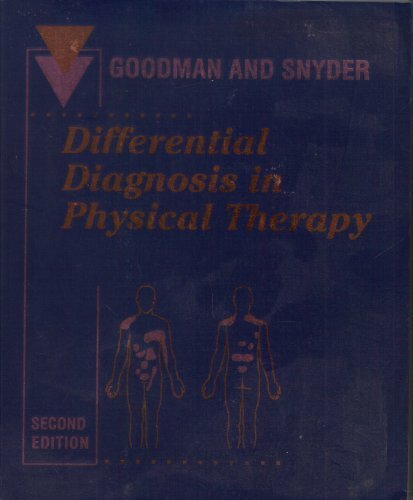 Key features of the text include: an emphasis on the interviewing process that provides a systematic aproach to patient/client evaluation and screening; physician referral sections providing guidelines for recommending medical attention or precautions/contraindications in therapy; case studies and examples demonstrating practical applications; information about disease aetiology, risk factors, pathogenesis, prognosis, diagnosis and medical treatment, identifying problems that mimic musculoskeletal conditions; illustrations of primary and referred pain patterns identifying systemic diseases; and summaries of important points from a systemic and neuromusculoskeletal frame of reference.